TrueNorth Cafe in Andersonville is offering huge, orange and tax-free Trumpkin spice lattes. ANDERSONVILLE — Looking for a pick-me-up after the second presidential debate? 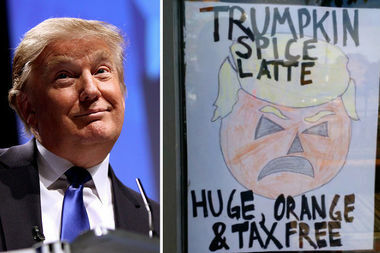 TrueNorth Cafe, 5507 N. Clark St., has the answer — a Trumpkin spice latte. The cafe's take on the pumpkin spice latte is "huge, orange and tax-free," according to a sign on the cafe and vitamin store. An employee came up with the name, but the company "wanted a tag line that was funny" and "huge and orange seemed too easy," said owner Andy Peters. "We decided to eat the sales tax because Trump doesn't have to pay taxes, so you shouldn't have to pay taxes to drink his latte," he said. The cafe has been selling the drink for about a week and decided to put a sign up advertising it over the weekend, Peters said. "All day yesterday and today people have been walking by and stopping in to try it," he said. "So far, no one has said anything negative about it. If someone is a Trump supporter, they can order a pumpkin spice latte." The drink uses a high-quality pumpkin pie syrup and is topped with pumpkin spice whip cream and pumpkin spice, Peters said. The 12-ounce drink costs $4.50, and 16-ounce servings are $5. When asked how long the cafe would be serving the latte, Peters said: "Hopefully, not past Election Day."